User Rating: "Be Weary 5/10"
On the beach with plenty of sun and a nice ocean breeze just makes this a fine place to stay while visiting Jaco. Multiple pools including a jacuzzi make sure that you will have all the fresh water you need to stay cool during the warm days. Many of the rooms have small balconies which are great for relaxing with a tropical drink while enjoying a view of the beach. 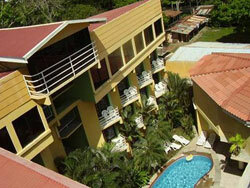 Comfortable open air restaurant which is one of the true pleasures of Costa Rica. The fine weather allows you to truely enjoy the environement even while dining. 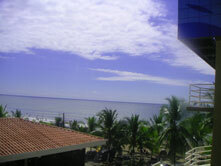 Here is a view of the Pacific ocean from one of the room balconies. To the right very nice restroom with whirlpool bath. 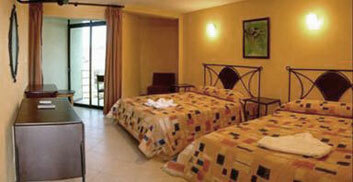 Not all rooms are the same and there are many rates to choose from. 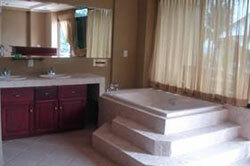 They have many different types of rooms to choose from and here are some examples. 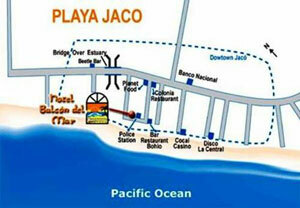 As you can see from this map below the hotel is located on the beach just off from the center of town. This allows easy access to everything Jaco has to offer. The first three floors have 20 rooms that have air conditioning, cable television, hot water, refrigerator, private balcony, with one to three beds in each. Queen bed, and two single beds. Room for two with two single beds. There are 6 rooms located on the 4th floor that are very spacious and have two panoramic windows in front facing the Pacific Ocean. They have a standard microwave and electric coffee pot. These have two queen beds. The first one is located on the 3rd floor and is equiped with air conditioning, cable TV, kitchen, livingroom, nice balcony, and a bathroom with a Jacuzzi. It has two rooms both with a queen bed. The second apartment is located on the 5th floor, with AC, bathroom, cable TV, with a huge window giving you a 180 degree panoramic view overlooking the beach. Apartment with only one bedroom with a queen bed. 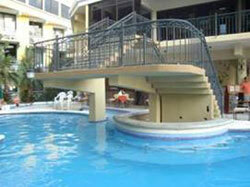 After reading many reviews of this hotel we have chosen to give this a "Be Weary and enter at your own risk". Make sure you reserve your room in advance.